Charlotte Munro, public service whistleblower reinstated. Nice to win sometimes. MORE questions have been raised than are being answered in the run-up to this election, but whoever wins, we should not let them go away. We're used to politicians telling us how much (of our)money they have thrown to the National Health Service, swearing how much they appreciate the service, and assuring us it is safe in their hands. We're not supposed to look whose hands are in the till. That's covered by secrecy, even though it is our business. At the beginning of this year came the news that an £80 million contract to run cancer scans had been given to a private health firm with a Tory MP on their board, despite a rival NHS consortium allegedly offering to carry out the work for £7 million less. The NHS Trust that runs Royal Stoke University Hospital in Staffordshire put together a consortium with other NHS hospitals to enter a “competitive bid” for a 10-year contract to run scans across Cheshire, Staffordshire, Shropshire, Liverpool, and Lancashire. The scans, known as PET-CT, are mostly used for diagnosing and measuring cancers. NHS England, the “head office” of the health service, rejected the bid and awarded the contract to Alliance Medical, a private health firm whose board members include former Tory cabinet minister and Kensington MP Malcolm Rifkind. Malcolm Rifkind is quitting as MP - and chair of the Commons Security and Intelligence Committee - after being caught offering his services in a cash for access sting. The same in which Labour's Jack Straw was seeking to provide for his old age. It must be true what they say about people struggling to keep up with the cost of living, and having to take extra jobs. Rifkind has been topping up his MP's salary, earning around £60,000 a year to sit on Alliance Medical’s board, according to public records. Alliance Medical has a turnover of around £120 million a year, so this scanning contract, worth an estimated £8million a year, is a significant part of its work. Alliance Medical said Rifkind was not involved in the bid. News of Rifkind's public disgrace brought an opportunity for questions in the House. DAVID Cameron has been challenged to reveal if disgraced ex-minister Sir Malcolm Rifkind influenced the awarding of an £80 million North Staffordshire NHS contract to a private company. The Tory MP sits on the board of Alliance Medical, which won the lucrative deal to diagnose illnesses in thousands of patients for 10 years. The company was chosen by NHS England in favour of a £7 million cheaper bid from a consortium of NHS trusts led by the Royal Stoke University Hospital. Now the Prime Minister has been asked to clarify Sir Malcolm’s role since he was secretly filmed offering access for cash to a private firm. Questions asked, but not answered. Joan Walley (Stoke-on-Trent North) (Lab): Given that it was not possible for me to raise in Health questions or with the chief executive of NHS England in a personal meeting the continuing concerns about the procurement of a PET scanner across Staffordshire, Cheshire and Lancashire, will the Leader of the House give assurances, amid concerns about openness and transparency, that there has been no undue influence from the right hon. and learned Member for Kensington (Sir Malcolm Rifkind) as a board member of Alliance? There are real concerns about the possibility of a monopoly service, which may mean that the contract will need to be referred to the Competition and Markets Authority. Will the Leader of the House find time for a proper, open debate about these continuing concerns? Mr Hague: The hon. Lady has raised related concerns before in the House. I am sorry that she was not able to do so in Health questions, because there will be no more Health questions before the election; we are entering a period in which some Departments will not have further questions before Dissolution. However, she is still able to ask written questions and to seek answers in every other way through correspondence with Health Ministers. I will draw their attention to the matter that she has raised. As Leader of the House, I cannot give her any assurances about what she has asked, but I know that my colleagues will want to attend to what she has raised in the House today. During Health Questions, Labour MP Jamie Reed asked Jeremy Hunt whether the Department of Health had any contact with Sir Malcolm before the contract was awarded by the government. Mr Reed asked: “Can the secretary of state explain why the more expensive private sector bid was chosen over the better value NHS which provides these services? Tu quoque, You too, might not be acceptable as an excuse or answer from accused criminals in court or schoolchildren, but government ministers think they can get away with it, as though by answering, or failing to answer, MPs this way they can ignore questions from the general public. Cancer care for patients in Staffordshire could be cut after it is taken over by profit-driven firms in the biggest privatisation of NHS services yet, campaigners are warning. Handing the £700m contract to the private sector could see hospices closed, less money being spent on treatment and patients left at risk of experiencing poor care, they claim. The fears follow the publication on Monday of a secret document prepared by the four local NHS clinical commissioning groups (CCGs) in Staffordshire involved in the outsourcing deal to rouse interest in the contract among private firms. They plan to appoint one company to act as the “prime provider” of cancer services, including diagnosis, treatment and aftercare, with that firm then sub-contracting more services. 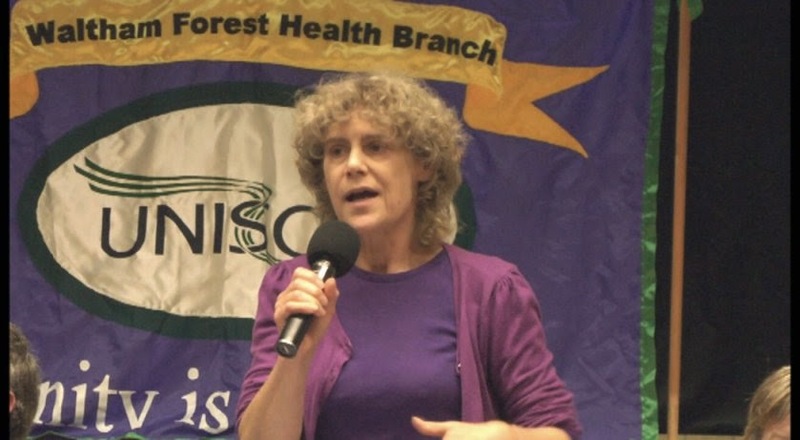 Campaigners – including Kate Godfrey, Labour’s parliamentary candidate for Stafford in the general election – claimed the document proves that the winning bidder will be “given ‘discretion’ to design services they would like to deliver, slash spend per patient and propose the payment structures most beneficial to themselves”. Godfrey also warned that front-line services could be sold off so that “core NHS responsibilities such as radiotherapy, surgery and chemotherapy could be delivered by the private sector, with no mechanism for patients to seek redress following failures of care”. In addition, she claimed, the winning bidder will be “given freedom to alter or exit any existing contract – for example, funding for much-loved hospice care – without patients given any chance to challenge”. Meanwhile, seven of the 11 private health firms which have jointly won a £780m NHS privatisation contract – the biggest yet concluded – have links to the Conservatives, Labour research shows. The seven include three companies which have been criticised for providing inadequate care to NHS patients or care home residents they were looking after. Two of them, Circle and Care UK, have been taken to task by the Care Quality Commission for that while a third, Vanguard, is under fire after 31 eye operations it performed under contract to the NHS last year left patients with continuing sight problems. For example, Vanguard is majority owned by MML Capital. Rory Brooks, its founder and chief executive, has donated £300,311 to the Tories and gets privileged access to David Cameron as part of the ‘Leaders Club’ of Tory donors. Care UK’s chairman until 2010 was John Nash, who was made a peer by Cameron in 2013 and is now an education minister in the House of Lords. He and his wife Caroline have given £251,000 to the Tories. Circle, which recently pulled out of running Hinchingbrooke NHS hospital in what was hailed as a pionerering extension of the private sector’s role, is part-owned by Lansdowne Partners and Odey Asset Management. Their founders, Paul Ruddock and Crispin Odey, have given £843,783 and £241,000 respectively to the Tories, and Odey’s firm another £20,000. With privatisation comes more secrecy, to keep the public in the dark, and that's not all. A secret letter from Consulting Association boss Ian Kerr to representatives of known blacklisting companies including Carillion, Skanska and Kier was among new documents published by the Commons Scottish affairs committee. “Every time we turn over a stone, we discover more evidence of the breadth and depth of the conspiracy to blacklist,” said committee chairman Ian Davidson MP. Dated February 2005, the letter shows that the Consulting Association contacted firms involved in facilities management in the health service, such as catering and cleaning. Former Carillion HR manager Liz Keates, who has been accused of blacklisting 139 construction workers, was one of eight addressed by the letter. The shocking revelation raises the possibility that NHS whistleblowers were being targeted, with a recent inquiry revealing that thousands of health staff have been bullied and intimidated by managers for raising patient care concerns. Mr Kerr’s letter has led to renewed calls by unions for a full public inquiry into the blacklisting, which has been promised by Labour if the party wins the general election. “We know that construction workers and environmentalists were blacklisted,” said GMB national officer Justin Bowden. “It is quite clear that Ian Kerr and the Consulting Association saw a role for their services in the NHS and questions should be asked whether Carillion and Liz Keates did so as well. The papers cast doubt on Carillion’s claims that it had no involvement with the Consulting Association from 2004 onwards, Mr Bowden added. The government is said to have asked health service employers for protection for whistleblowers. But will that be for those who spy on fellow workers, or report "waste", rather than those who, like the blacklisted building workers, showed concern for health and safety at work, or in the health service, exposed ill-treatment or neglect of patients? We have seen how government legislation that was supposed to curb big business lobbying has been turned instead to a "gagging law" to inhibit public interest campaigners. Sacked Whipps Cross hospital shop steward Charlotte Munro has won her industrial tribunal and been reinstated by Barts Health Trust, 15 months after her sacking. Charlotte, who received a warm reception when she spoke at the Left Unity founding conference in November 2013, had worked as an occupational therapist at the Walthamstow east London hospital for 34 years. When Charlotte raised concerns about hundreds of Barts Trust workers being downgraded and cuts all across East London, she was sacked on trumped up charges of breaching confidentiality. Since she was the best known trade unionist at the hospital, her sacking was a major blow to the confidence of the workforce and their morale at a time of significant attacks on jobs and pay. The industrial tribunal found in her favour just weeks after the Care Quality Commission found that Barts Health Trust had a culture of bullying, which was part of the reason for it being into ‘special measures’. Charlotte’s victory is also a victory for the local Unison branch and local campaigners who had fought tirelessly for her reinstatement. “I am really happy to be returning to work with my team and the rest of the staff at Whipps Cross Hospital and Barts Health NHS Trust. And I look forward to being able to contribute to the work I understand is now under way, in response to the CQC report, to bring about improvement in our hospital. It’s vital that Whipps Cross becomes again a hospital of choice for health staff to work in, where they can provide the best standards of health care to our local population, and find a good future. “Health staff must be able to speak out for their patients and services without fear. They must be free to organise themselves in trade unions and stand as representatives knowing that their rights as a union rep will be respected, and that the role of an independent union campaigning for the interests of the staff, their patients and services is also respected. These were issues at the heart of my case. Its resolution will I hope contribute to building a climate of openness and confidence so needed in our health service. "Benefits Cheats"? But they're within the rules. Freedom of Speech, so long as you keep shtum?